Manx Tholtans, a special exhibition exploring these fascinating ruined buildings on the Isle of Man is now open at the Manx Museum. Supported by WH Ireland International Wealth, the exhibition was launched with a private preview at the Manx Museum, attended by the Island’s Lieutenant Governor Sir Richard Gozney, Chief Minister Howard Quayle and guests of WH Ireland International Wealth. Manx photographer Ray Kelly and his partner, multimedia artist Niamh Kelly capture the beauty of the Island’s abandoned farm buildings in this special exhibition, which features stunning photographic prints, carefully complemented with detailed 3D ceramics by Niamh, alongside a life-size sculpture of a sycamore tree. Ray Kelly has spent the last 30 years seeking out tholtans (the Manx word for the ruins of a building) across the island and his passion for these derelict farmhouses can be seen throughout the exhibition. Discussing the inspiration to hold this exhibition, Ray Kelly says; “Having been born a Manx man with a long tradition of farming, I have an interest in keeping the heritage of the Isle of Man alive. Walking in these remote places, the feeling of tranquility is overwhelming, and I am mindful of the hardship that the inhabitants of these buildings endured to survive and make a living. 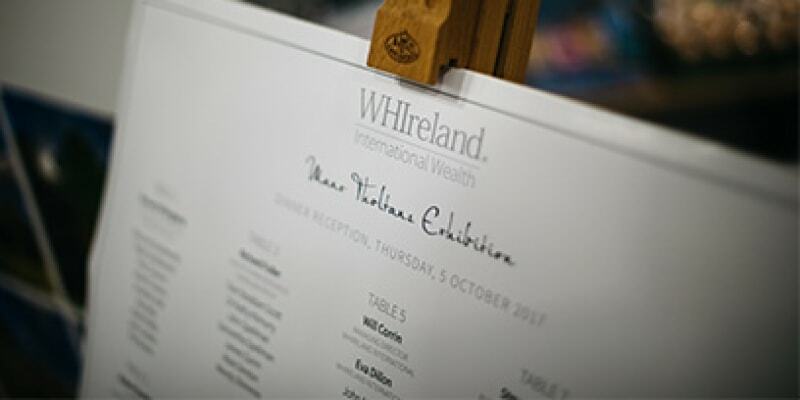 Recently shortlisted for Investment Management Company of the Year Isle of Man in the 2018 Citywealth International Financial Centre Awards, WH Ireland International Wealth is a keen supporter of the Island’s community, culture and heritage. WH Ireland International Wealth Head of Investments, David Bushe said: “It is a privilege to work with Manx National Heritage to help support the staging of this exhibition which perfectly portrays the magnificence of the Manx countryside and these haunting and unique buildings. Edmund Southworth, Director of Manx National Heritage, adds; “Manx National Heritage sets itself at the heart of the island’s community, be that by community outreach projects, running workshops for local schools, welcoming visitor’s right through to protecting our heritage and customs. We are delighted to welcome opportunities to support our local business community and have thoroughly enjoyed working alongside WH Ireland International Wealth, who share the same values and passion for the island’s heritage, to provide this special exhibition which explores Manx Tholtans. Take a look at photos from the evening.